A small green citrus fruit providing juice or peels that are added to food dishes to provide a tart taste as an ingredient. The flavor of a lime is stronger and more tart than a lemon, but it can typically be substituted for a lemon. Limes are prepared in different ways in order enhance the flavor of other foods or to enhance the presentation. 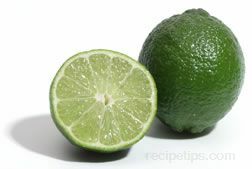 As an example, lime zest is created from the green part of the skin or peel of the lime to add flavor when cooking and baking. Lime zest strips can be made by using a paring knife or vegetable peeler to slice off thin pieces of the green peel. When slicing off the pieces, care should be taken to not remove any of the bitter white pith. To grate the lime zest, rub the lime against a metal grater, making sure to turn the fruit so that only the green part of the peel is being removed and not the white pith. A citrus zester can also be used to remove the zest from the lime. The zester removes the zest in fine threads, which can be minced as an alternative to grating. Limes are also used in a dried form to season a variety of food dishes. Common in Middle Eastern cooking, limes are dried whole so they can be added into foods with moist ingredients that allow the dried lime to reconstitute, so as it softens the flavors are released and absorbed by the food being prepared. Some of the varieties of limes available include the the Persian (Tahitian)lime, the Bearss, the Key, Mexican and West Indian limes, the Palestine sweet lime, and the Kiffir lime, although the Kaffir is not considered to be a true lime. The larger limes most often available in food stores are the Persian limes, which is a variety that is also known as the Tahitian or the Bearss lime. The Bearss is the seedless variety of the three. The Key lime, which is similar or the same as the Mexican and West Indian lime is a very small variety of lime that is mainly used for making desserts and sweets, such as Key lime pies. The small varieties of lime have an intense flavor that provides a sharp lime taste when used as an ingredient. Palestine sweet limes are similar to the Tahitian or Mexican lime and are considered to be a cross between either lime species and a sweet lemon or citron. With a green to orangish-yellow coloring, this type of lime is juicy and often eaten as a snacking lime for the juice or pulp that has a sweeter and less tart taste than the Persian or Tahitian lime. The Kaffir lime, also known as the Kieffer, Thai or wild lime, is not considered to be a direct member of the lime species. Instead it is catagorized as one of the subspecies of citrus fruits that are linked to the lime family. This variety of lime has a very bumpy outer skin and is smaller in size. The peels from this type of lime as well as the leaves from the Kaffir lime tree are commonly used as seasonings in Asian recipes for fish, meat, poultry, vegetables, marinades, and chutneys. Since the flesh of the Kaffir is not edible, it is the grated peel or leaves most commonly used for foods. The leaves are typically torn or chopped into bits to be added to curry dishes, soups, fish stews, and poultry dishes to enhance the flavor with a citrus taste. When selecting limes, choose those that are firm and somewhat heavy feeling. Check for brown or yellow blemishes to the skin. Since limes perish quickly, keep them refrigerated for up to a week.